Comments: Tobie Tobias didn't run Flemington all that often, but when he did, you knew he was there! 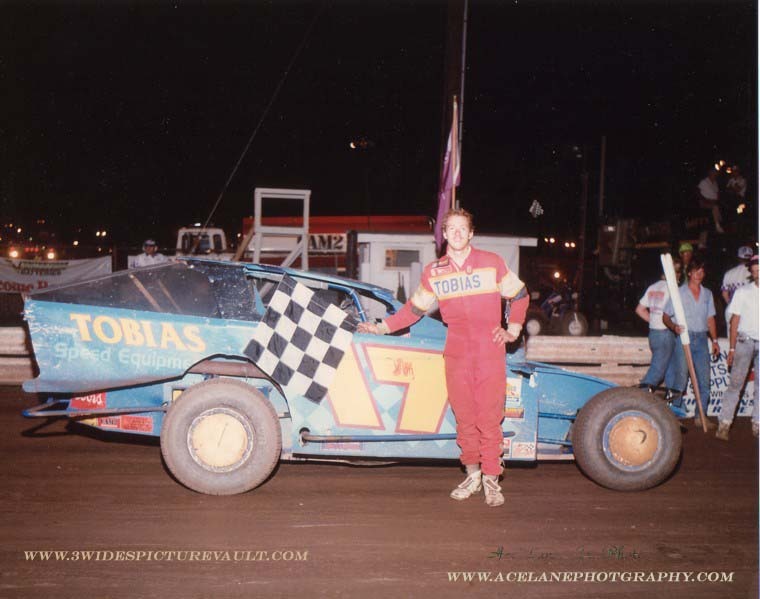 04/12/03 Todd L Does any one remember Toby's running at EWS with a lightweight equipped with a Sprint Car fuel cell? Toby towed that same car to Fulton, NY where he was racing 5 wide in to the corners, He was rocket fast until he ran out of fuel. I think I have pictures of the EWS car and when I find them they will be here. 01/13/04 Fred Voorhees Yes, I remember Toby attempting the asphalt at Flemington that first year in the Romeo 44jr. Trouble was, Toby's style just wasn't suited to the asphalt at the time. He was just about the toughest on tires that I remember. MAN, did he smoke those shoes! I remember the Miller Motorsports the year that the asphalt was about to begin its first year and the Romeo machine was on display. It was an absolutely awesome looking machine. 11/27/07 PJ Wyer He sure was fun to watch at the square. I remember one nite in the late 80's his wife gave him a new Ford Pick Up Truck at intermission for his birthday.